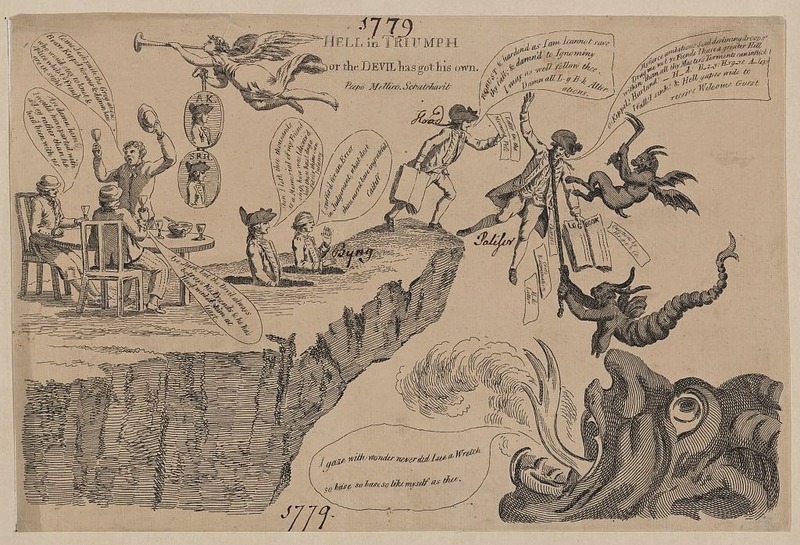 "Hell in Triumph or The Devil has got his own," 1779, Library of Congress. The First Battle of Ushant in 1778 is important for several reasons. It was the first major fleet action between the French and the British in the American Revolutionary War, It was also the first battle that the legendary Victory fought in. The battle, however, is not remembered for these reasons, but for the political squabbles that came out of them. Tactically a draw, the British suffered far more casualties than the French, and the battle was abandoned when Admiral Sir Hugh Palliser failed to obey the signals of the commanding Admiral Augustus Keppel. Though legendary in his own right, Keppel was not entirely free from blame for the outcome of the Battle of Ushant either. Accusations flew back and forth between the two admirals, exacerbated by the Whig-Tory divide between them. Both men were tried by courts martial and acquitted, but the damage was done. Keppel's astounding naval career was over, but he became a political figurehead for the opposition in Parliament. After the fall of the North Administration in 1782, Keppel's political career was briefly revived with his appointment to First Lord of the Admiralty. This was not to last: he resigned after the Treaty of Paris the next year. This political cartoon is part of the Whig victory lap in the wake of Keppel's acquittal. It portrays Sir Hugh being dragged by demons into the waiting maw of Satan, clutching an altered log book. Behind him stands Keppel's Whig ally Hood. The corpses of Byng and an unidentified admiral, who rise from their graves, condemn Palliser. Beside an angel trumpeting Keppel as a hero, three sailors gather around a table with glasses of punch. Raising his glass in toast, a tarpaulin sings out: "Come Jack, push the Grog about. Brave Keppel forever & damn him who wou'd stay to knot & splice whilst ye French are in sight." To this Jack replies, "Aye damn him. I would have parted with a Leg rather than he had been with us." Seat at center is a third who joins in: "Aye Jack, but the Devil always betrays his Friends & he has Hood-winked him at least." It is comforting to know that I'm part of a long tradition of terrible puns. 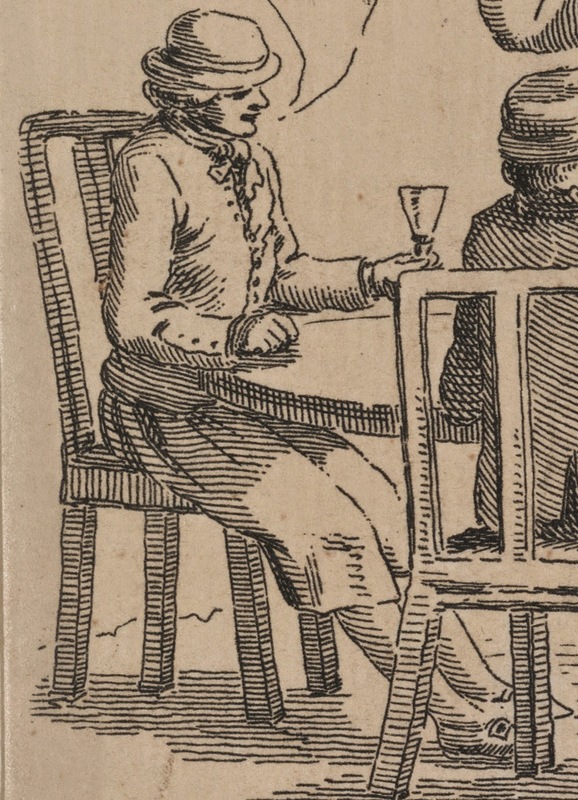 The standing sailor has a short brimmed plain round hat in one hand, and a tall glass in the other. His jacket is single breasted, and he wears a closely tied and short plain white neckcloth. Seated before him and delivering his pun is a tar with a cap (possibly knit, but there isn't enough detail to be certain). His jacket has button down mariner's cuffs, and appears to be single vented at the back. It is possible that the jacket is triple vented, but hidden by the chair. His trousers have narrow vertical stripes, and end well above the ankle. Jack wears a cap as well, and a single breasted jacket with cuffs that match that of his mate. His neckcloth is also white and short. Jack wears slops that end at about the top of the calf, showing off his stockings and pointed toe shoes with rectangular buckles.